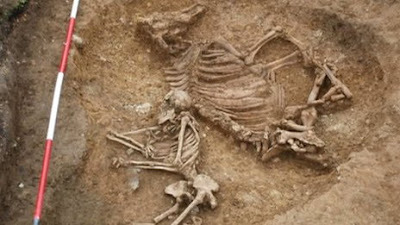 Four Iron Age skeletons have been found at Stratford's London 2012 Olympics site. No pictures, though, nor an actual date. If it's Late Iron Age, though, the skeletons could be Roman(ish), but this Telegraph piece suggests the skeletons are prehistoric. Anglo-Saxon (6th c AD) burials have been surfacing for a century in Oakington, England. Current Archaeology details some of the finds, including a woman who died during pregnancy (which I can add to my growing list of mother-fetus burials). So this is also Anglo-Saxon, but it is a really cool find - a woman buried with a cow. According to the article, only 31 burials with animals have been found in England... all of them male and all of them with horses. This woman buried with a cow is a very interesting discovery, and I hope more information about it comes out soon. Let's hope the start of summer excavations at various sites in Italy will bring some interesting skeleton finds next month!